President Muhammadu Buhari last night justified the continued detention of former National Security Adviser (NSA) Col. Sambo Dasuki (rtd) and leader of the Independent Peoples of Biafra (IPOB) Nnamdi Kanu. He said those who committed serious crimes against the country cannot be granted temporary freedom because they could jump bail. Speaking during his maiden 'Presidential Media Chat' on television, Buhari said the severity of the crimes allegedly committed does not permit granting them bail. 'Technically, if you see the type of atrocities these people have committed against the republic, against the country, when you think about it, you can't allow them to jump bail,' he said. Apparently referring to Dasuki, he said: 'Technically if you see the kinds of atrocities those people committed against the country. If they jump bail, see the former President wrote to the governor of central bank and said give N40bn to so so and so, and then he gives account and you release him to go and see his doctors in London, while about 2 million IDPs who don't even know their parents; what kind of country is that? On the insurgency and the abducted girls, the President said the Federal Government was open to negotiating with credible leaders of the Boko Haram sect. He urged Nigerians to take the issue of N50 billion proposed for federal lawmakers' cars to court, adding that If he could reject N400 million personal cars as a president, he expected the lawmakers to toe the same line. 'For all I know, the first time I turned down a N400million bill for cars for the Presidency. I said the vehicles I am using are good enough for the next 10 years. 'But I understand there is a pool for the protocols when Heads of States and Governments visit they have to buy vehicles. As for the National Assembly, we are having problems with them on the Treasury Single Account (TSA), everybody has to subject himself to the TSA as long as federal money is involved. 'But I turned down about N50 billion for vehicles, I think I have to hold a closed door meeting with them and I think they have not bought them yet. 'I think we are doing quite well, considering the circumstances, first, this will be best illustrated by my personal experience. In fact, 30 years ago when I was in uniform as Head of State, we arrested people who were perceived to be corrupt and put them in protective custody and we told them they are guilty until they can prove themselves innocent. Now I am here in a different form, in a multi party democratic system and the nation we are looking forward to cooperation, under the circumstances we found ourselves in - security wise and economic wise, even morally. 'The only acceptable decision to them is those suspected to be corrupt are innocent until they are proven guilty. Having said that we have been lucky to find some documents, where public funds were diverted to personal pockets. 'Our main constraints, eventually, the persons have to find themselves in court and under any circumstances we cannot pre-judge what the court will do but the document we are going to submit and how the government will add to it through the Minister of Justice, is what we have to develop the patience to do because once we go to court, we shall keep our mouths shut. We cannot determine issues when they are still in court. On when he will make full declaration of his assets based on his promise, he said: 'I have declared my assets four times. I started during Murtala administration. I declared when I was military administrator or northeastern states, I declared when I was a member of supreme military council and minister of petroleum and when I was leaving for the war college in 1979 and when I became head of state in 1983, I declared my assets. But when I was removed I did not declare because I was in detention. And when I came back as civilian president, I declared, making four times. 'If you want my declarations, you have the constitutional right to go to the code of conduct bureau. All my declarations were documented in the Ministry of Justice. So if the ministry of justice cannot produce my declarations, they too should answer some questions on where they keep declarations of public officers. I don't have to ask them to provide my declarations. 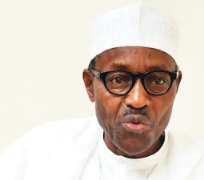 On moves to bring back the Chibok girls, he said: 'This is about the third time I will answer on Chibok girls. I could recall that so many leadership of Boko Haram existed. But we insisted on establishing the bonafide leadership of the so-called Boko Haram leadership before we can agree to negotiate with them on what terms will be of interest to us before we can take them to their schools. 'Secondly, we want to ensure that they are complete, 209 and they are safe and sound. But what we also found talking to a lot of sources is that no Chibok girl has been recovered, they must have dispersed them all over the place, and wanted as far as humanly possible, although some of their parents are desperate they would rather see their graves or the conditions some of them should be in. 'We are still keeping our options open, that if a credible leadership of Boko Haram can be established and they tell us where those girls are we are prepared to negotiate with them without any pre-condition. This we have made it absolutely clear, but where they are keeping the Chibok girls, they must not get away with the idea that we will not attempt to secure the rest of Nigeria. On whether he has intelligence reports on the girls whereabout, he said: 'That is what I'm looking for. We are looking for a credible Boko Haram leadership that will convince us that the girls are there and alive. If any of Boko Haram can come out to say it is the leader and that he knows where Chibok girls are we cannot automatically believe him. 'That kind of information, I'm working with Niger, Chad and the Cameroon and I assure you that the question of Chibok girls is only on our minds for even humanitarian reasons, but there is no such intelligence reports of where those girls are physically are and in what condition they are in, but what we believe in from our intelligence, is theta they keep shifting them around so that they are not taken by surprise until the girls are freed, and they are not kept in one place. 'I was in touch with the governor of Kaduna State and the president of Iran talked to me about it. We have a system of investigation as a government and as the head of the Federal Government, I have to wait for official report before I comment. 'The Police and the SSS are doing their own role of finding out what happened. In any incident where lives and property are lost, there is a standard way of doing things and people would be asked to come and give evidence. How can any group create a state within a state? I saw a clip in which some dissidents were virtually hitting the chest of Generals. 'I expect the Kaduna State government will bring the report on the inquiry because the crisis happened in its domain. There are all sorts of allegations. So, we just have to wait for the report. 'The Benin IDP camp is a good intention that went sour. Despite the problem, the Edo State Governor, Adams Oshiomhole, was kind enough to have found school for the children. The Federal Government is aware of the situation and ready to take them to where they came from. 'We have about two million IDPs; over 70 per cent are women and children. Over 65 per cent of the children are orphans. Some Nigerians contributed money, about N25 billion Naira, a committee was set up to utilise the funds. Within the week I was sworn in, I went to Chad and Niger. I was impressed with the goodwill they gave Nigeria on this issue. Railway project '`By second quarter of 2016, we will take the Chinese contractors back to continue with the railway project,'' the president said. 'We will not be talking about subsidy by the end of first quarter next year. 'I hope that our refineries will be working. We cannot do it overnight, but that is our priority now to get them working. 'All these things will take time. We said during our campaign that we will diversify the economy to agriculture and solid minerals.
' We are hoping that these sectors will generate jobs and our budget has shown that we will focus on those sectors. 'Also, we have focused on education and other key sectors of the economy. 'Some investors are ready to come and invest in those sectors but our problem is to secure this country first,'' the president said. 'We said agriculture and solid minerals are the easiest way to get people employed and our budget would show that. We have virtually all forms of solid minerals across Nigeria.